The Flea Theater will present the World Premiere of A LIGHT LUNCH by A.R. Gurney, beginning previews December 12. The production, directed by Flea Artistic Director Jim Simpson, marks the fifth collaboration between Gurney and The Flea. A LIGHT LUNCH was written expressly for The Bats, The Flea’s resident company of emerging actors. A LIGHT LUNCH features The Bats: Havilah Brewster, Beth Hoyt, Tom Lipinski, and John Russo. The design team includes John McDermott (sets), Miranda Hardy (lights), Erin Murphy (costumes) and Jill BC DuBoff (sound). A.R. (“Pete”) Gurney has been writing plays for over fifty years. Among them are: Scenes from American Life, The Dining Room, The Middle Ages, The Cocktail Hour, Love Letters, Sylvia, Far East, Ancestral Voices, Big Bill, Mrs. Farnsworth, Indian Blood, Crazy Mary, and Buffalo Gal. He has also written three novels, a few television scripts, several unproduced movies, and the librettos of two operas. Gurney is a member of the Theatre Hall of Fame and the American Academy of Arts and Letters. He has honorary degrees from Williams College and Buffalo State University, and taught literature at M.I.T. for many years. Jim Simpson is the Founder and Artistic Director of The Flea Theater (2004 Drama Desk cited for Downtown Adventurous Theater). Two-time Obie Award winner, 2002 National Board of Review Excellence in Filmmaking, and cited for artistic leadership in Downtown New York by the Lower Manhattan Cultural Council. Jim has directed over 70 works for the theater and has also directed for film and television. Venues include nine seasons at the Williamstown Theater Festival, Alley Theater, Hartford Stage, Yale Rep, Actor’s Theater of Louisville, Eisenhower Theater at the Kennedy Center, Lincoln Center, Playwrights Horizons, EST, CSC, MCC, the London International Theater Festival and the Melbourne Fringe Festival. Most recently, Jim directed A. R. Gurney’s Crazy Mary at Playwrights Horizons; Will Eno’s Oh, The Humanity…; revivals of Peter Handke’s Offending The Audience and Joseph Addison’s Cato; and Dawn by Thomas Bradshaw at The Flea. 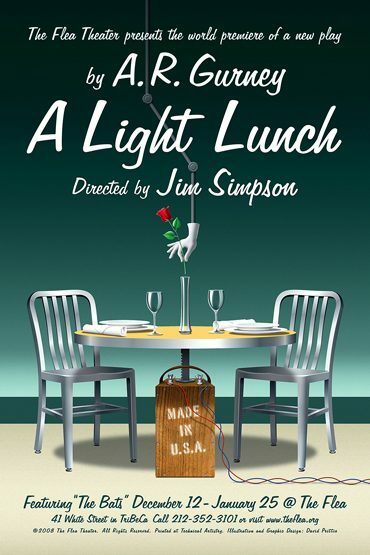 A LIGHT LUNCH runs December 12, 2008 – January 25, 2009; performances are Weds. – Fri. at 7pm, Sat. at 3pm & 7pm and Sun. at 3pm. (Note: No shows Dec. 24, 25 & 31, Jan 1-3; added performances Dec. 22 & 23 at 7pm.) Running time is 1 hour and 20 minutes with no intermission. Tickets are $20 – $25.